Foreign, European Country Collections, Austria (cat. $1701), Bulgaria ($1552), Denmark, Finland ($1468), Greece, Iceland, Ireland, Netherlands ($1473), Norway, Portugal ($1519), Spain, Yugoslavia, early 1940's to 1990's, mixed mint and used but mostly mint, incl. Back-of-Book, hinged on pages, a few partially stuck down, generally Fine to Very Fine. Foreign, Scandinavia Better Mint Collection, hundreds of o.g. (early issues) and n.h. in 3 Scott specialty albums and 2 Davo albums (no Finland), Sweden 1886 to 1998, Norway 1925 to 2000, Denmark 1884 to 1999, Iceland 1876 to 1999, Greenland to 1991, nice collection to expand, generally Fine to Very Fine. Foreign, Large Dealers Stock, Many thousands sorted by country and catalog number in 59 binders, mostly used with a scattering of modern mint sets, lots of Western Europe, Scandinavia, Hungary, Israel, Japan (modern mint sets), cat values to about $40, mostly Fine or better. Foreign, Extensive Scandinavia Mint Stationery Stock, Sweden, Finland, and Norway, 2121 mostly early to mid 20th, identified by Higgins & Gage, Michel, Facit and/or "EAPC" numbers, Sweden 991 - $3961, Norway 537 - $3782, Iceland 542 - $3481, all priced and sleeved, minor dupl, large section of Aerogrammes (heavy dupl. ), mostly $2-$18 range, clean, total retail $7884. Ex. Friedman "Cover Corner" Stock. Foreign, Mostly Europe Mint Oldtime Lot, mostly mint with n.h., strong selection of predominantly mint issues from late 1920s to mid 1970s, strength in European countries Andorra, Germany, also Surinam, Saar with some Iran and U.N., occasional large quantities, such as Greece #876-78 (400), Fine to Very Fine. Foreign, Six African Countries, Algeria 1940 to 1992 (cat. $1065), Cameroun 1941 to 1991 ($974), Central African Republic 1959 to 1985 ($986), Egypt 1944 to 1958 incl. some better Occupation ($1320), Ethiopia 1942 to 1999 ($1134), sparse after mid 1970's, Gabon 1959 to 1992 virtually complete ($1955), mostly mint, incl. Back-of-Book, hinged on pages, a few partially stuck down, generally Fine to Very Fine. Foreign, South America Collector's Accumulation, few thousand used and mint on stockpages, auction lots, glassines and Scott albums, collector was accumulating countries before mounting in the albums, several good items sprinkled throughout, worth a look, Fine. Foreign, Four Latin American Countries, Brazil 1941 to 1994 ($1651), Colombia 1940 to 1994 ($984), Mexico 1941 to 1998 ($1199), Venezuela 1941 to 1991 ($1411), mostly mint, incl. Back-of-Book, hinged on pages, a few partially stuck down, generally Fine to Very Fine. Foreign, Four French Colonies, o.g., French Andorra 1940 to 1998 (cat. $1034), F.S.A.T. 1955 to 1989 ($848), Lebanon 1942 to 1989 ($1226), New Caledonia 1892 to 1998 ($1239), hinged on pages, virtually all mint, incl. Back-of-Book, a few partially stuck down, generally Fine to Very Fine. Foreign, Four Country Collections, Indonesia 1950 to 1998 (cat. $914), Iran 1960 to 1987 ($1044), Laos 1951 to 1997 ($929), Turkey 1941 to 1994 ($1828), incl. Back-of-Book, hinged on pages, almost all mint, a few partially stuck down, generally Fine to Very Fine. Foreign, Latin America Accumulation, Thousands in 6 stockbooks, majority used, generally Fine to Very Fine. Foreign, Norway/Sweden, 1855 to 1989 Mint and Used Collection, Hinged and mounted in Minkus Album, 19th and early 20th Century mostly used, then fairly comprehensive mint from 1955 onwards, generally Fine to Very Fine. Foreign, Better Sets, 24 better sets or singles, mostly o.g. 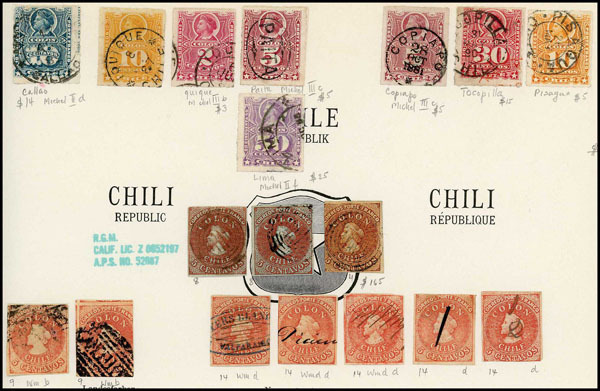 including used Belgium #B106, mint Iceland 273, Ionian Islands NC10, Russia 1280-1283, and Slovakia #2-23, generally Fine to Very Fine. Foreign, Small Selection, Ethiopia #258-62 n.h. (pencil note on gum), France 329 (2 tiny thins at bottom), Germany B60a and B63a n.h., Switzerland 226 o.g. (h.r. ), 5Ø8, 5Ø11-12, 5Ø14-25 n.h., Fine to Very Fine centering. Foreign, Eastern Europe Collection, o.g. and used, few n.h., Danzig, Silesia, and Central Lithuania on hand-made pages in 5 albums and stockbook, some varieties and blocks, a few better items, generally Fine to Very Fine. Foreign, Small Mint Group of Better European Souvenir Sheets, n.h., Over 60 mostly modern with minor dupl., incl. Belgium #B605, Cyprus #226a, Netherlands B144-145a, modern Faroes, few oversized strips, Very Fine.